Cartooning, illustration and animation legend Arnie Levin joins the show to recount his epic career and life. We talk about Beatnik-era New York, his mother’s decades-long plot to turn him into a New Yorker cartoonist, the value of a good art director, telling the Marines he wanted to be a photographer, his two-minute education in directing animation, what it was like to see his style copied by an artist who was previously copying another artist’s style, the time Allen Ginsberg tried to give him an iguana, and more! Give it a listen! And go check out his work at Art.com! Born in 1938, the diminutive Levin sports the shaved head, handlebar mustache, and slightly rolling gait of a badass biker. Much of his upper body is tattooed with ornate Japanese imagery by a renowned yakuza body illustrator. And the more you learn about his life, the wider the gap between creator and creations seems to spread. Levin served in the Marines before winding up as an aspiring painter amid New York City’s late-fifties beatnik heyday. “Swept up in the glamour of the beatnik era,” as he puts it, Levin co-operated an espresso house that hosted readings by the likes of Allen Ginsberg and Jack Kerouac. He worked parties as a rent-a-beatnik, encountering Bob Dylan, another new kid in town, during one such event. At Push Pin Studio, then at the height of its influence upon the design world, he was plucked out of the messenger pool by Milton Glaser, who recommended him to Lee Savage’s Electra Studio, famous for its forward-looking movie trailers and commercials. After leaving Electra, Levin was recruited for The New Yorker by art director Lee Lorenz in 1974. 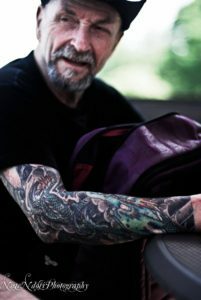 After taking up motorcycling at age of fifty-nine, Levin celebrated his new hobby with the aforementioned flurry of tattoos. He’s given up biking in the interests of personal safety, however, and now resides more or less quietly on Long Island in New York with his wife. Credits: This episode’s music is Nothing’s Gonna Bring Me Down by David Baerwald, used with permission from the artist. The conversation was recorded at Arnie’s home on a pair of Blue enCORE 200 Microphones feeding into a Zoom H5 digital recorder. I recorded the intro and outro on a Heil PR-40 Dynamic Studio Recording Microphone feeding into a Cloudlifter CL-1 and a Mackie Onyx Blackjack 2×2 USB Recording Interface . All processing and editing done in Adobe Audition CC . Photo of me and Arnie by me. It’s on my instagram. Photo of Arnie’s ink by Nate Ndosi. 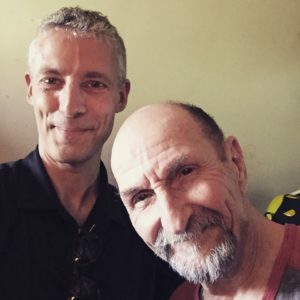 Legendary cartoonist, illustrator, animator, ad-man, artist RO Blechman joins the show to talk about his work and life. 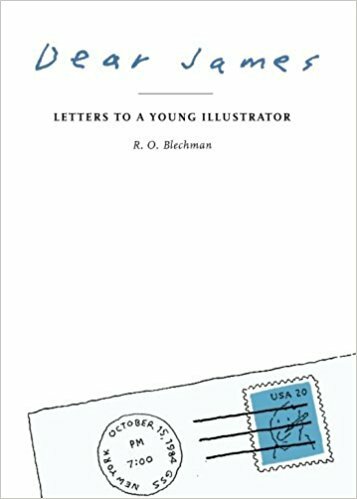 We get into the importance of play, the development of his trademark squiggly line (and how he feels when he sees it in other people’s work), his literary upbringing, his News of the Weak series of painting/collages, why he counsels against going to art school, the fateful career decision that he rues 60+ years later, his Mad Men experience and what he learned about management from running his own animation studio, the mistake of turning down a Curious George movie, creating a fore-runner of the graphic novel, and being a 2-D character in a 3-D world. Give it a listen! And go buy all his books, including Dear James: Letters to a Young Illustrator , Amadeo & Maladeo: A Musical Duet , The Juggler of Our Lady , and Talking Lines ! 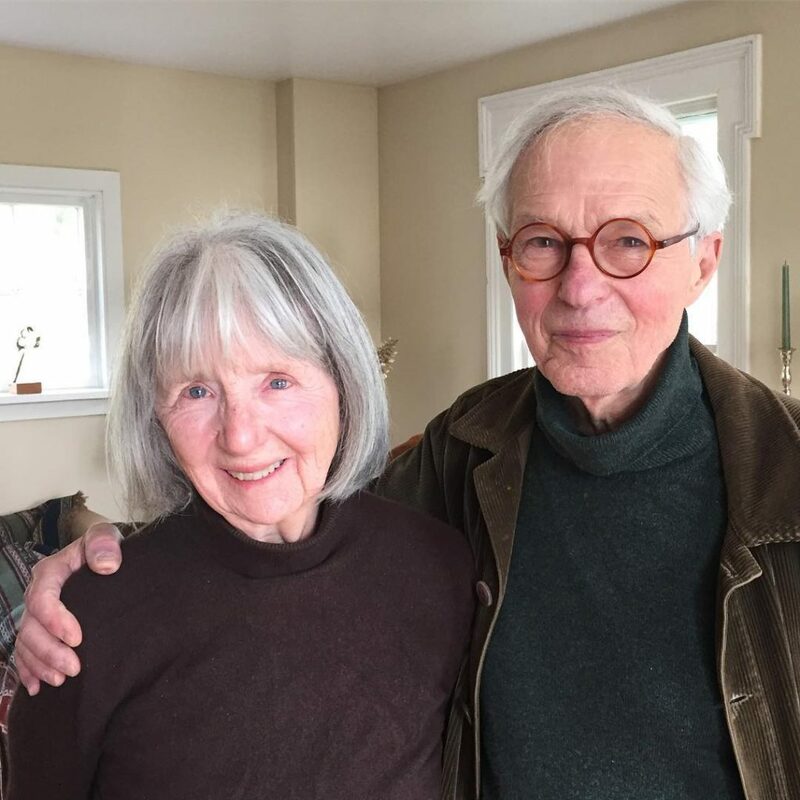 Born Oscar Robert Blechman in 1930, RO Blechman‘s internationally acclaimed artwork spans decades, mediums, and industries. 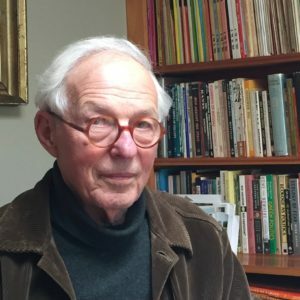 He is one of the first contemporary cartoonists to pen a full-length graphic novel with The Juggler of Our Lady in 1953, which he published after graduating from Oberlin College. His illustrations and comic strips have graced magazines, anthologies, and newspapers. He has created more than a dozen New Yorker covers. Blechman is also an animated filmmaker, and at one time owned his own animation studio, The Ink Tank. He has been awarded the Gold Medal from the Cannes Film Festival, numerous Emmy Awards, and has been nominated for a BAFTA. In 2002, the Museum of Modern Art held a retrospective of his films. He is also in the Art Directors Hall of Fame, has been an Adweek Illustrator of the Year, and is the creator of many notable advertising campaigns. Blechman is married, has two sons, and lives in Ancram, NY. Here’s a bio of him that Edward Sorel wrote in 1999. His own version is at his site. Credits: This episode’s music is Nothing’s Gonna Bring Me Down by David Baerwald, used with permission from the artist. The conversation was recorded at Mr. Blechman’s farm on a pair of Blue enCORE 200 Microphones feeding into a Zoom H5 digital recorder. I recorded the intro and outro on a Heil PR-40 Dynamic Studio Recording Microphone feeding into a Cloudlifter CL-1 and a Mackie Onyx Blackjack 2×2 USB Recording Interface . All processing and editing done in Adobe Audition CC . Photos of Mr. Blechman and his wife by me. It’s on my instagram.